Nails and staples and glass oh my! The urban landscape is littered with sharp and nasty things all conspiring to end your ride. But you’ll fear no flat with the Ultimate Puncture Shield, Velowürks best puncture protection. A special layer of high elasticity rubber is permanently bonded into the tire carcass to preserve good rolling characteristics and covers the full tread area to stop penetration of sharp objects. A full 5mm under the tread center provides complete flat protection and tapers at the tread edges keeping the sidewall supple for improved shock absorption and smooth, predictable handling. 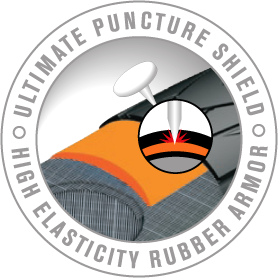 • Complete puncture protection from glass, staples, nails, etc.